Make these Mexican Style, spicy Instant Pot Refried Beans at home. This electric pressure cooker recipe requires no soaking, no draining the extra liquid and is super delicious. Here is how to make Refried Beans in Instant Pot. Refried Beans, also known as frijoles refritos, is a classic Mexican dish and my family’s Tex-Mex favorite. The easiest dinner or side that you are ever going to make is this recipe. Honestly, instant pot refried beans are the easiest thing to make and require zero prep. No need to soak and make them in a snap. You can make them as spicy as you like by adding some jalapenos. These are vegan, another win-win. You can choose to add chicken stock instead of vegetable stock to add some extra flavour. If you love bacon, use lard or bacon fat in place of olive oil. You will never think of any other recipe for refried beans. You can even use black beans in place of pinto beans. All you need to do is throw everything in the instant pot and cook. Serve these creamy mashed beans as a side or spread for your tortilla fix, make some delicious burritos, enchiladas or tacos. You can even serve it as a dip or with nachos. So why wait? 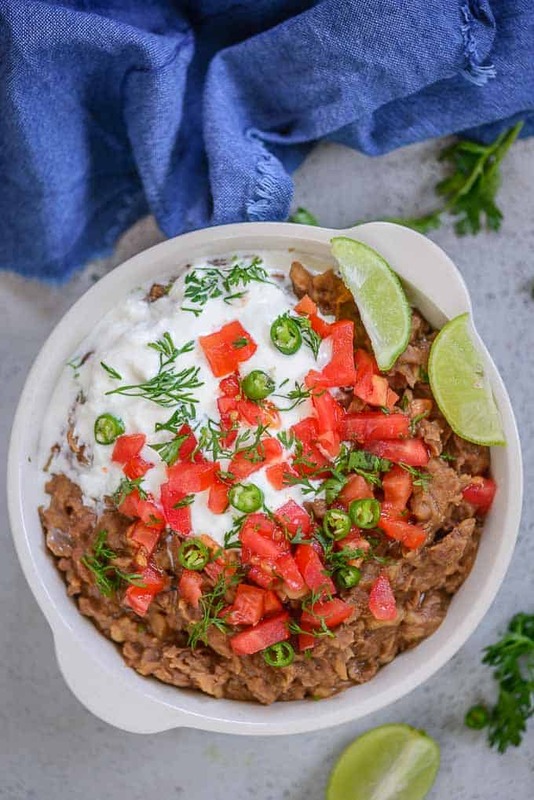 Make these creamy Mexican instant pot refried beans today. 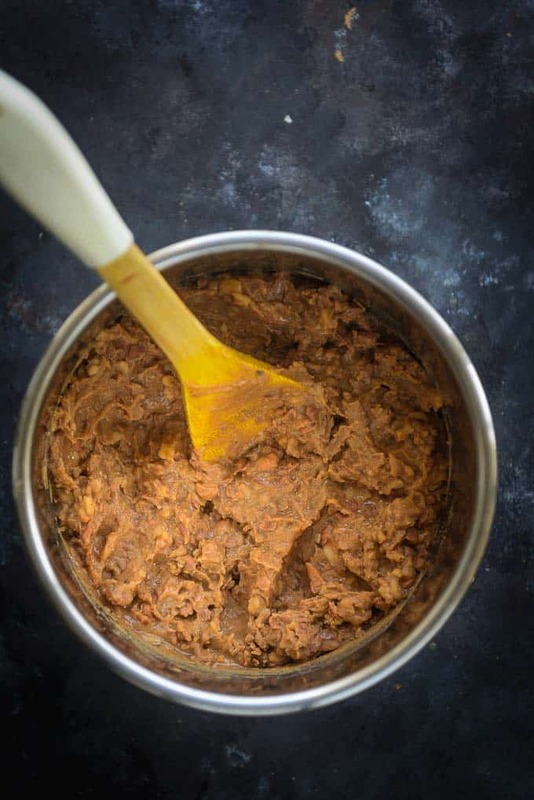 How to make Instant Pot Refried Beans? 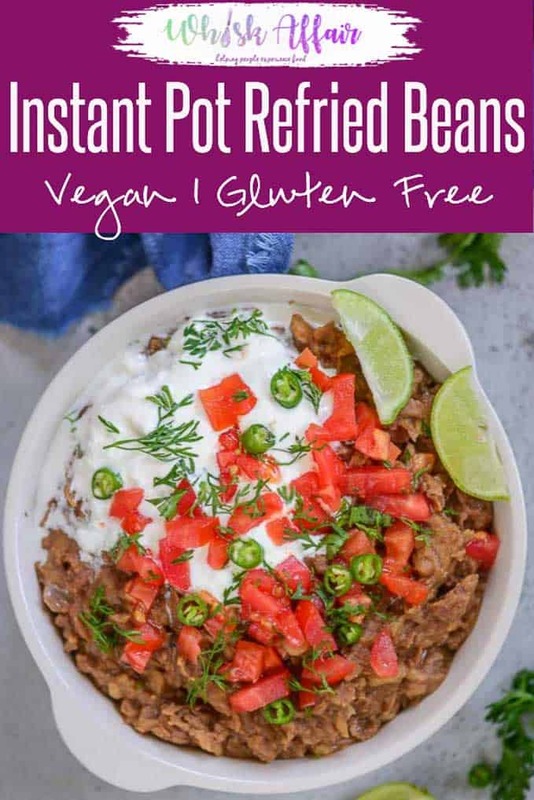 To make instant pot or electric pressure cooker refried beans, you are going to need pinto beans, vegetable broth, bay leaf, onions, garlic, salt, cumin powder, chilli powder, ground pepper, cayenne pepper, oregano, olive oil, and water. I like to use my Homemade Vegetable Broth to make this recipe but you can totally use the canned one. Take everything in the suggested quantities and keep on a side on the countertop. This will save you a lot of time and you will not forget to add anything. First, rinse the beans under running water to get rid of any dirt. Properly clean them and transfer the beans in the instant pot along with vegetable broth, bay leaf, onion, garlic, salt, cumin powder, cayenne pepper, oregano, oil and water. You can even use chicken broth in place of vegetable broth. Cover the lid of the instant pot and set the valve to sealing. Press PRESSURE COOK and set the timer to 40 minutes. The instant pot will take some time to build the pressure and start (approx 25-30 minutes). Once the timer goes off, let the pressure release naturally for 15 minutes and then release the steam vent. Make sure you let the pressure release naturally to get the best texture. Open the lid of the Instant pot. Discard the bay leaf. Puree them using a potato masher or a hand blender. Keep a softer consistency as it solidifies quickly. Add some more boiling water if the consistency of the benas looks thick. Check for salt and other seasoning. What kind of beans to use to make refried beans? Usually pinto beans are used to make refried beans. They are creamy and add a slightly sweet, earthy taste. They mash easily and add the texture that you need for refried beans. You can even use black beans. They are the second best. Can you freeze Instant Pot Refried Beans? You can even keep it refrigerated for 4 – 5 days and use as required. 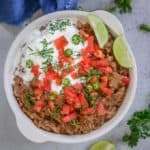 How to make Pre Soaked Instant Pot Refried Beans? Although if you are cooking in instant pot, you don’t require pre-soaking. But pre-soaking the beans makes them easier to digest, and our bodies can absorb more nutrition. Pre-soaking also helps in reducing the gassiness. You can just replace the dried beans with pre-soaked beans and reduce the cooking time to 8 minutes. Keep the remaining process same as mentioned in the recipe. Can I use canned beans to make Refried Beans? I prefer dried beans instead of canned beans, but if you have canned beans available, you can use them. When using canned beans, you don’t need to use instant pot. You can make it in a skillet and it will be ready in no time. Make these Mexican Style,spicy Instant Pot Refried Beans at home. This electric pressure cooker recipe required no soaking, no draining the extra liquid and is super delicious. Here is how to make Refried Beans in Instant Pot. Rinse the beans under running water. Transfer the beans in the instant pot along with vegetable broth, bayleaf, onion, garlic, salt, cumin powder, cayenne pepper, oregano and oil. Cover the lid of the instant pot and set the valve to sealing. Press PRESSURE COOK and set the timer to 40 minutes. Once the timer goes off, let the pressure release naturally for 15 minutes and then release the steam vent. Puree the beans using a potato masher. Add some water if the consistency is too thick.